Source: Taisha,chap. 7; reproducedin Qiu (1972): 56-58. 本文發表於 2010-01-20 at 3:45 下午 且歸類為 台灣, 台灣獨立與社會運動, 日本時代, 林木順. 你可以發表回應於 RSS 2.0 feed. 你可以 留下回應, 或 自你的網站引用. Frank S. T. Hsiao（蕭聖鐵）在美國科羅拉多大學波德校區經濟學教授。Ph.D., University of Rochester, 1967. 1. Beckmann, George M., and Genji Ōkubo. 1969. The Japanese Communist Party 1922-1945. Stanford, Calif.: Stanford University Press. 2. Chen, Ching-Chih. 1975. “The Japanese Adaptation of the Pao-Chia System in Taiwan, 1895-1945.” Journal of Asian Studies 34, no. 2: 391-416. 3. Chen, Edward 1-te. 1972. “Formosan Political Movements under Japanese Colonial Rule, 1914- 1937 . ” Journal of Asian Studies 3 1, no. 3: 477 – 97. 5. Hsiao, Frank S. T., and Lawrence R. Sullivan. 1979. “The Chinese Communist Party and the Status of Taiwan, 1928-1943. ” Pacific Affairs 53, no. 3: 446-67. 6. Hsiao, Frank S. T., and Lawrence R. Sullivan. 1980. “The Politics of Reunification: Beijing’s Initiative on Taiwan.” Asian Survey 20, no. 8: 789-800. 8. 葛智超Kerr, George H. 1965. Formosa Betrayed. Boston: Houghton Mifflin. 9. Kerr, George H. 1974. Licensed Revolution and the Home Rule Movement 1895-1945. Honolulu: The University Press of Hawaii. 10. 黃昭堂. 1970. 《台灣民主國の研究》. 東京: 東京大學出版會. 11. 黃昭堂. 1981. 《台灣總督府》. 東京: 教育社. 13. 郭乾輝. 1955. 《台共叛亂史》. 台北: 內政部調查局. 14. Lamley, Harry J. 1970. “The 1895 Taiwan War of Resistance: Local Chinese Efforts Against a Foreign Power.” In Taiwan: Studies in Chinese Local History, ed. by Leonard H. D. Gordon. New York: Columbia University Press. 15. 李稚甫. 1955. 台灣人民革命鬥爭簡史 華南人民出版社. 16. McKenzie, Kermit. 1964. Comintern and World Revolution:1928-1943. New York: Columbia University Press. 17. 王育德. 1970. 《台湾：苦悶するその歴史》. 東京: 弘文堂. 19. Scalapino, Robert A. 1967. The Japanese Communist Movement, 1920-1960. Berkeley: University of California Press. 20. Scalapino, Robert A., and Chong-sik Lee. 1972. Communism in Korea. Vol. 1. Berkeley: University of California Press. 25. Tsurumi, E. Patricia. 1980. “Mental Captivity and Resistance: Lessons from Taiwanese Anti- Colonialism.” Bulletin of Concerned Asian Scholars1 2, no. 2: 2-13. 27. 矢内原忠雄. 1929. 《帝国主義下の台湾》. 東京: 岩波書店. 有關這點如果讀盛岳的英文書(有簡体版)列寧是饑餓輸出革命! !自己國民都非常困苦, 但外國來的留學生吃住等都免費, 過的非常享受! !更荒唐的還有一天5餐, 搞得留學生受不了, 主動要求減少!! 所以大家都相信莫斯科是天堂! !但這是葛蘭西的Hegemony(巨魔)將喇叭搶到手, 的宣傳手法! 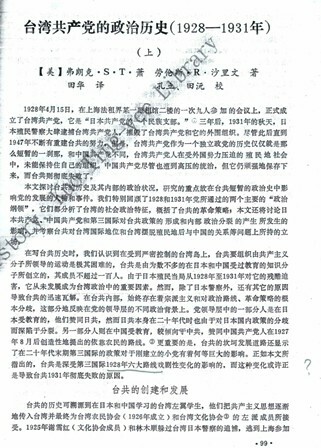 如果再讀日本最近出版的以檔案所作研究, 史達林很殘酷的屠殺同志超過千萬, 令人髮指. 共產主義運動在列寧, 史達林, 毛澤東, 蔣介石父子等人, 已經把共產黨運動玩死完臭, 似乎沒有希望從中間挖掘出可供後人學習與傳承的經典. 而原文是： The reminder of the party was almost immediately decimated by the Japanese police in Shanghai. 山邊健太郎編《現代史史料Vols. 20—社會主義運動7》. 1964-1972.. 東京: みすず書房.